In this paper the Critical Cost Efficiency Index scores of individuals are compared with their behaviour and choices in the housing sector and mortgage market. The created dataset allows for a combination of laboratory and real word data. 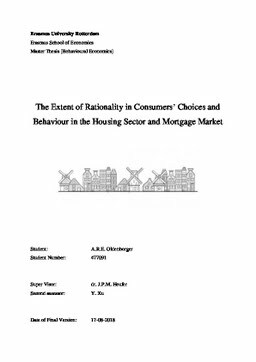 Consumers\' choices and behaviour in the housing sector and mortgage market cannot significantly be explained by rationality. Nevertheless, some individual characteristics and the average national mortgage interest rate seem to have an influence on consumers’ choices and behaviour. The tested models indicate that a larger dataset might improve the results.